Scientists have taken the first snapshots of another solar system, ushering in a new era in astronomy. The infrared images show a family of three giant worlds orbiting a young hot star in the constellation of Pegasus, 130 light years from Earth. A light year is the distance light travels in a year - 6trillion miles. In another development also reported in Science, Nasa's Hubble Space Telescope photographed a single Jupiter-sized planet called Fomalhaut b orbiting a close neighbour of the Sun just 25 light years away. In future, astronomers hope to capture images of Earth-sized planets in other solar systems. Analysing the light from their atmospheres could reveal the existence of life. 'It is a step on that road to understand if there are other planets like Earth and potentially life out there,' said astronomer Bruce Macintosh, one of two teams who make the 'extra-solar' system photographs. None of the four giant gaseous planets are remotely habitable or remotely like Earth. But they raise the possibility of others more hospitable, and Macintosh said it's only a matter of time before 'we get a dot that's blue and Earthlike'. 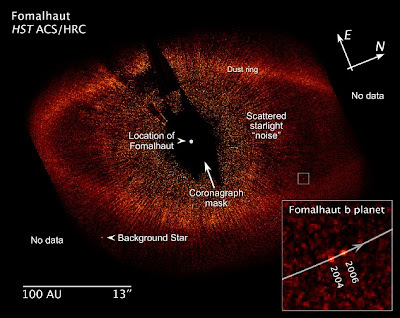 Fomalhaut b which circles the star Fomalhaut, pronounced FUM-al-HUT, and is Arabic for 'mouth of the fish' was found by astronomer Paul Kalas, from the University of California and his team. 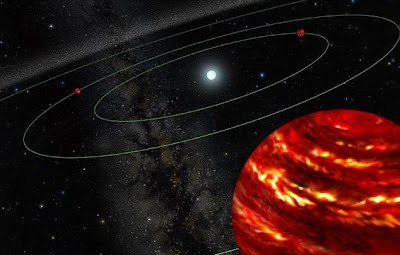 Until now, astronomers have relied on indirect methods to detect 'extra-solar' planets - those outside our solar system - which are normally impossible to see because of the blinding glare of their parent stars. But the planets described today in the journal Science were photographed directly, using high-precision ground-based telescopes and sophisticated computer processing to cancel out the light from the star. Christian Marois of the Herzberg Institute for Astrophysics and his team used the Keck and Gemini telescopes in Hawaii to find the three planets near the star called HR 8799, which is just visible to the naked eye. "We thus do not have a full picture,' he told BBC News. 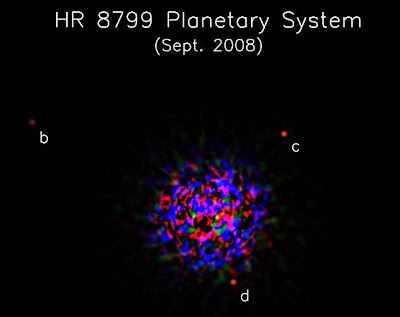 "The detection of the three planets around HR 8799 does not mean that no planets are orbiting at smaller separations. 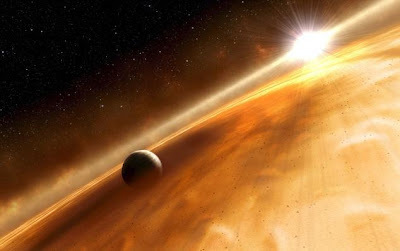 Other gas giant or even rocky planets could reside there." 'You see an object next to a star and you might think it's a planet,' Mark McCaughrean, an astrophysicist at the University of Exeter, told BBC News. 'But you have to watch it for several years and make sure that it moves around the star and with the star as it moves across the sky. Though I've been very sceptical in the past, these ones all seem pretty real to me. 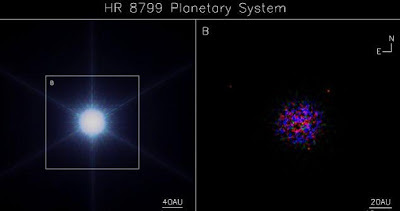 The parent star of the three-planet family is known as HR 8799. It is 1.5 times more massive than the Sun, and five times brighter, but less than 100million years old. In comparison, the Sun was formed around 4.5billion years ago. Two of the planets are thought to be around ten times heavier than Jupiter, and the third is about seven times more massive. In size, they could have diameters 20 per cent to 30 per cent larger than Jupiter's. The planets are very young, only about 60million years old, and still glow with the heat generated by their formation from contracting lumps of dusty debris. Like the giant planets orbiting the Sun, they lie in the outer regions of their solar system, roughly 25, 40 and 70 astronomical units (AU) from their star. An astronomical unit is the distance between the Earth and the Sun, about 93 million miles. Previously astronomers have only managed to detect planets orbiting relatively close to stars, usually at distances of less than five AU. Imaging the planets directly also made it possible to analyse their atmospheres. All three are said to have 'complex' atmospheres containing dusty clouds. Since the 1990s, astronomers have collected a tally of around 200 detected extra-solar planets. Most have been found using the 'wobble' method which looks for tiny disturbances caused by gravity. As a large planet orbits a star, the gravitational tug between them causes the star to 'wobble' slightly, which affects the light it emits. Another technique detects the minute dimming of a star's brightness when a planet passes in front of it, an event called a 'transit'. Dr Bruce Macintosh, from the Lawrence Livermore National Laboratory in Livermore, California, said: 'Until now, when astronomers discover new planets around a star, all we see are wiggly lines on a graph of the star's velocity or brightness. 'Now we have an actual picture showing the planets themselves, and that makes things very interesting. 'We've been trying to image planets for eight years with no luck. This is a milestone in the search and characterisation of planetary systems around stars. HR 8799 is a hot, blue A-type star, yet only faintly visible to the naked eye. It was being studied as part of a survey of 80 similar stars located in the Sun's stella neighbourhood. The historic pictures were captured using the Gemini North and Keck telescopes, both situated on Mauna Kea in Hawaii. Adaptive optics, which bend a telescope's mirror to counteract the blurring effect of the Earth's atmosphere, were used to produce the highly detailed images. Advanced computer processing was also applied to block out the light of the star so the planets could be seen. The Hubble images are of a planet about the size of Jupiter buried in a dust belt surrounding the star Fomalhaut, which is easily visible to the naked eye in the southern constellation of Piscus Austrinus (Southern Fish). Formally given the designation Fomalhaut b, scientists believe the planet could have a ring system. It is a long way from its parent star, at a distance of around 119 AU. The planet's existence was suspected in 2005 when it was discovered that Fomalhaut had a dust belt with a sharp edge that was slightly off-centre. This suggested that a planet's gravity was shaping the inner edge of the belt. Astronomer Dr Paul Kalas, from the University of California at Berkeley, who led the discovery, said: "It's a profound and overwhelming experience to lay eyes on a planet never seen before." Even using Hubble's "starshade" or coronograph to reduce a star's glare, the planet would have remained hidden had it not been in such a wide orbit. 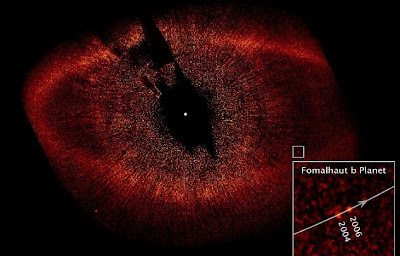 Fomalhaut is around 200million years old and 16 times brighter than the Sun. It will burn out in about a billion years, making it a very short-lived star. Both teams of astronomers had to take a number of photos over a period of years to be sure they really were seeing planets and not background objects unrelated to the stars. Dr Bruce Macintosh said he suspected more planets exist in HR 8799's family that cannot be detected using current technology. 'One of the things that distinguishes this system from most of the extra-solar planets that are already known is that HR 8799 has its giant planets in the outer parts - like our own solar system does - and so has 'room' for smaller terrestrial planets, far beyond our current ability to see, in the inner parts,' he said. He is leading a team constructing an adaptive optics system designed to find planets that will be 100 times more sensitive than the one used to observe HR 8799.